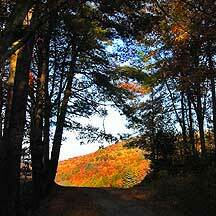 Your gateway to a fabulous mountain vacation! Click on the image to download and view our new brochure in PDF format! 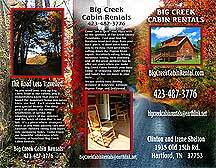 We would like to invite you & your family to stay with us in our beautiful mountain cabins located on the banks of Big Creek and the French Broad River in beautiful east Tennessee. 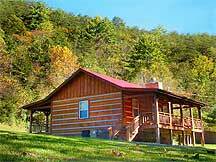 Our cabins are nestled near the Great Smoky Mountains National Park on over 4 acres of land with a stocked trout stream. Some of our many amenities include jacuzzi baths, hot tubs, fully-equipped kitchens, picnic areas creekside with charcoal grills, satellite TV and gas log fireplaces. We supply towels, sheets, dishes, glassware, and kitchen implements so all you need to bring is yourself, clothing and your groceries. We are within easy driving distance to Gatlinburg, Pigeon Forge, Dollywood, and the Great Smoky Mountain's National Park on the Tennessee side. Equally close are Asheville, the Carl Sandburg Homeplace, Biltmore Estates, Maggie Valley, Pisgah National Forest, Hot Springs, Cherokee and Harrah's Casino. 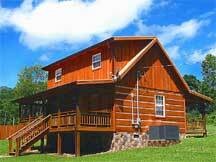 Deluxe cabin with two queen bedrooms/ two baths and a sleeping loft with a queen-sized bed. Extra amenities include jacuzzi, dishwasher, and washer and dryer. Located on the bank of Big Creek. 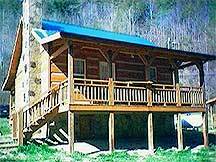 One bedroom/one bath cabin with two queen beds. 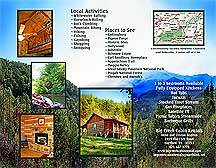 Amenities include gas log fireplace, hot tub and creekside picnic area. One bedroom/one bath cabin with one queen bed. 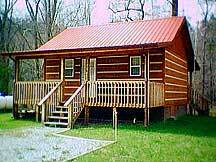 Amenities include gas log fireplace, hot tub and creekside picnic area. One bedroom/one bath cabin with one queen bed. Amenities include a wood-burning fireplace, riverside picnic area and a fully-equipped kitchen. Located on the bank of the French Broad River. Curious to know what this Cutter Gap looked like, I slid out of bed and hobbled stiffly over to one of the windows. Nothing had prepared me for what met my eyes. Mountain ranges were folded one behind the other, in the foreground snow-covered; behind that, patches of emerald green showing through; on beond, deeper green. Then the blues began. On the smoky blue of the far summits fluffy white clouds rested like wisps of cotton. I counted the mountain ranges, eleven of them rising up and up toward the vault of the sky. The Great Smokies...now I understood. That peculiar smoky-blue color and the adjective "great"---so right for these towering heights.